KAK is short for Krazy About Kona. It’s where I’ve been retailing my work for 9 years. My largest display of work anywhere. Over 50 metal prints covered the walls. My time there was a great success. The owners are retiring but, of course, I’m not. This post is to let everyone know that all displayed metals are being liquidated at 50% off. You won’t see prices like this again for my work on metal. If you know any realtors or decorators, send them down there fast. The closing sale started a few days ago and prints are moving fast. Everything is cash & carry so if it needs to be shipped, it’s your responsibility. You can easily carry 12 x 18’s and 12 x 24’s on a plane. The UPS Store for larger ones. Sizes available are, 12 x 18, 12 x 24, 15 x 30, 16 x 24, 18 x 36, 20 x 30, 24 x 36, 24 x 48, 30 x 45 and 40 x 60. I have a crate available for the 40 x 60. They could close sooner if everything sells quickly. KAK also has jewelry and glass work. All by local artists. All that work is 25% off. You can take a virtual tour and get directions here on google maps. I haven’t made any plans yet as to where I’ll show/retail next on the Kona side of the island. I’m weighing my options and for now concentrating on the closing. If you know of any place that is interested in carrying my work to any degree, have them contact me at BryanLowry@lavapix.com. When the time comes I’ll post about my new location(s). I’ve included a few images of my display at KAK and what’s there. Some of the metal prints shown have been sold. All taken with my phone. 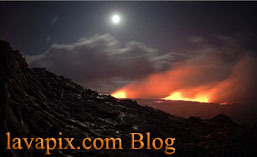 Videos of the newest lava flow ocean entry at Kilauea volcano Hawaii Volcanoes National Park. I arrived at the new ocean entry about 15 minutes after it started. You can see how the new delta/bench (new land) grows as the video progresses. As its been throughout this new flow, it was quite windy. Videos of this event are from my Nikon D800 and the Gopro Hero 3+. In the Nikon shot video I sped up a few clips to show how the steam plume swirls as it rises. There will be a follow-up blog post once I’ve edited my still photos. Having said my usual warning, let me add that this flow is accessible via hikes of at least 9 miles round trip. Expect large crowds of people. Be sure to carry at least 3 liters of water per person. Always use extreme caution at the sea cliffs and never walk out onto new land as it could easily collapse into the ocean taking you with it. As the bench grows the immediate sea cliff will be vulnerable to collapse also. I highly recommend you watching this HVNP safety video on safety at ocean entries. Also, its best not to breath if you find yourself engulfed in the steam plume. If you think you will be in it often, be sure to wear a respirator.